If you are a grandparent intent on carrying out your role the way God designed it, no doubt you’ve come across Psalm 78. From this one passage, writers and speakers craft messages to grandparents on generational vision and impact, the role of teaching and telling, and the consequences of failing to carry out that role. But I can get overwhelmed – by the sheer amount of great information shared from that passage and by what it looks like, in the everyday, to carry out this crucial role. Sometimes it is necessary for me to step back and examine one small piece at a time. This passage instructs me to tell. Tell what? The work of the Lord, His provision and faithfulness, His grace and glory, His power to transform. I am to tell my grandchildren who God is and what I’ve seen Him do in my life. The sharing of our testimony isn’t something we do once, and then check it off the list. Done! Our “telling” is to be ongoing – when we sit, walk, lie down, and rise. Some of the most meaningful conversations occur when we are engaged in the everyday activity of life. Learn to see these moments together with your grandchildren – preparing dinner, doing homework, watching TV, playing at the park – as opportunities for telling your story. One episode at a time, as it fits naturally into your activity. Not for your fame but for His glory. Just as our prayer life requires both brief, spontaneous prayers offered throughout our day as things happen – and scheduled times of concentrated, intentional prayer – so it is with the sharing of our testimony. In addition to the informal conversations of everyday moments, we must also include planned times for sharing our story. Take the initiative. Institute bedtime devotions when your grandchildren spend the night and use the time to talk about the works of the Lord. Read Scripture before the day begins or after enjoying a meal together. Then discuss what the passage tells you about God’s character. When you ride in the car, consider sharing your favorite Bible verse with your grandchild and then explaining to them why it is special to you. And if these suggestions aren’t feasible because your grandchildren live miles away; consider setting up similar “sharing” opportunities via FaceTime, Skype, or other technology throughout the year. Then plan for face-to-face sharing when the family is gathered for holidays or other special events. Share your testimony with your grandchildren around the dinner table. In a culture where family mealtime is all but obsolete, be the grandparent who refuses to let go! Commit to reoccurring time together around the dinner table whether it be once a week or once a month. Then spread the word, getting it on the family’s calendar. Stick with it. Enjoy your family’s favorite foods and all the benefits of shared mealtime. And while you’re sitting there all together, be sure to share your God-story as part of the conversation. One of the most powerful tools any grandparent can utilize is that of asking questions. 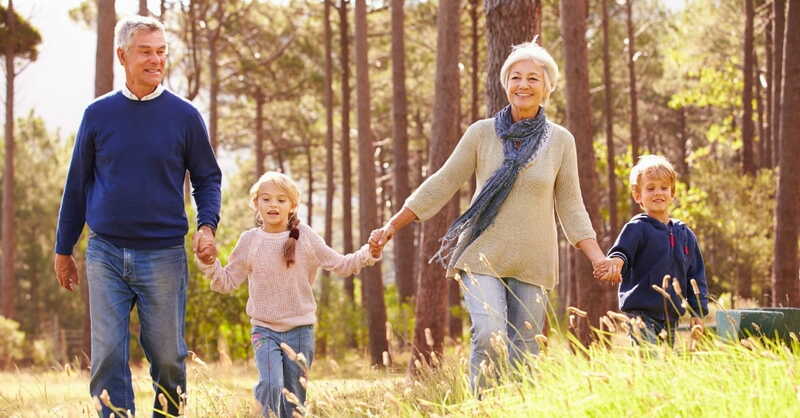 Your questions can help you learn much about your grandchild, forge connection, deepen relationship, and serve as a conversation starter. Contemplate the idea of introducing your story through a single question or sharing your personal experience through a series of questions that have been pre-planned. Questions are not only wonderful conversation starters, they can be used to discover what your grandchildren believe, reveal the heart, and encourage deep thought about the identity of God. In addition to sharing your testimony with your grandchildren orally, be sure to share it in writing. One easy way to do this is through journaling. Record your testimony of God’s faithfulness, His provision, His glory, and His grace in a journal. Then present it to your grandchildren – maybe for a milestone birthday or graduation. Keep an ongoing journal with your grandchildren. In it, record things you are each thankful for. As you make new entries or review existing ones, talk about what He is doing in your lives. Praise His faithfulness and His provision. Purchase a Bible to be given to your grandchildren. Personalize the Bible by highlighting Scripture that is important to you and adding notes in the margin about why it has this importance. Include other handwritten notes in the Bible about who God is and His work in your life. Share your spiritual markers as a way of sharing your testimony. Several years ago I went through Henry Blackaby’s Experiencing God Bible Study. In the study, he explained spiritual markers (something that identifies a time in your life when you clearly know that God guided you) and encouraged participants to gather theirs. I will admit, at the time the assignment felt daunting. However, to this day, it remains one of the most significant and impactful things I have ever done. Do you remember when you became a child of God? Note the highlights. Are there times in your recall when you know without a doubt that God spoke to you? Have there been times when you know He clearly guided you in decision-making? Can you specifically remember times when He called you to live according to His way? Record these moments as they come to mind. Then rehearse them, regularly. This is the “stuff” of your God-story – a testimony of how God has worked in and through your life. Share it with your grandchildren. Each spiritual marker is a story all its own. Choose one and share it orally or in writing. All the markers together tell a bigger story – the of God’s ongoing work in your life. Share the bigger story by recording it in a journal to be handed down to your grandchildren. Or get creative. Sometime after participating in the Blackaby study, I put together a spiritual marker’s beaded bracelet. Each bead on my arm represents a marker. Over the years, this has become an unexpected, yet powerful tool for sharing my testimony with my grandchildren and others. An item of jewelry prompting comments and remarks, opens the door to the telling of my story. No pressure. No anxiety. And with my grandchildren, it’s even sweeter. They love to look at the bracelet, touch the beads and hear the stories. Amazingly, they want to hear the story that each bead “tells,” and they don’t seem to tire of it. The wonderful blessing is that with every telling, my grandchildren are hearing my story which is ultimately, God’s story. And now, some of my older grands are even using the beads on the bracelet as prompts for trying to tell my stories back to me. If sharing your testimony with your grandchildren is a new idea for you, all these ideas about everyday moments, intentional meals, journals, and spiritual markers may sound wonderful. Still, one more how may be hanging in the air. Whether the opportunity presents itself or is intentionally created, how do I tell my story? Share it all – the good, the funny, the sad, and the hard. Tell how God poured out His love and grace no matter the circumstance. Be open and honest. Don’t hold back on sharing the struggles and how God helped you through them. Your experiences (yes, all of them) and the wisdom you gained can be invaluable to your grandchildren. Keep your focus on God. The purpose in our “telling” is to exalt God through the sharing of our personal experience. It’s not about us! Every believing grandparent has a testimony – a story of how God has worked in his or her life. And we are instructed to tell our story so that our grandchildren will see God; learn to love Him with all their heart, soul, strength, and mind; grow in spiritual maturity; and walk in His ways. Help the generations to come to see the greatness and glory of God and to know who He is. Deborah Haddix is the author of Biblical Portrait of Grandparenthood: Discovering and Living Out God’s Design for Our Role. She serves as co-coordinator for Christian Grandparenting Network’s Grandparents Day of Prayer. She also writes, blogs, speaks, and coaches on topics related to biblical grandparenting. You can find resources Just for Grandparents on her website.